THEY'RE a team of superheroes, but they’re not nice guys...they’re the Abnormals. 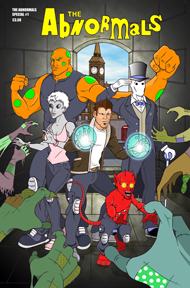 The first issue sees a creepy assortment of robots, demons and even scarier critters overcome some malevolent ghosts in London’s underground. It’s a portent of evil things to come. Nice artwork and some interesting characterisations by writer/artist: Grant Springford (the man behind another great independent comic I liked, Pest Control). Anyways, this is a nice start to a promising new series. Check out Grant’s work at www.theabnormals.co.uk.